Most Canadian municipalities have numerous storm sewer outfalls that discharge untreated stormwater runoff to watercourses/water bodies. In the past, the potential impacts of discharging untreated stormwater runoff were not fully appreciated. However, in recent years, it is widely recognized that untreated stormwater runoff can have adverse impacts on aquatic habitat and the use of these watercourses for recreational uses. Stormwater quality controls are required for most new urban development projects in Canada. In fact, many Canadian municipalities look for opportunities to retrofit existing drainage systems to improve stormwater quality. Stormwater quality controls can be provided in various ways including: source controls; conveyance controls; and end-of-pipe controls. The challenge for most Canadian municipalities is that there is limited opportunity to implement conventional stormwater quality controls in existing developments. For example, there is usually insufficient space available to construct a stormwater management pond. The Town of Newmarket, Ontario reconstructs several roads each year to an urban standard (i.e. with curbs and storm sewers). Whenever the Town reconstructs a road, they review the feasibility of providing stormwater quality controls. Stormwater quality controls are required to comply with the provincial guidelines (Ontario Ministry of the Environment) which stipulate a reduction in total suspended solids of at least 70% on an annual basis. It is also desirable to trap oil and floating debris. The Town of Newmarket retained R.V. Anderson Associates Limited (RVA) to prepare the design for reconstruction of three roads in an older part of the Town. It was proposed to construct storm sewers on these roads and fill the roadside ditches. However, the ditch along one road had a relatively large drainage area (approximately 32 hectares) and there was no space available to construct a stormwater management pond. In addition, the road allowances were only 20 m wide and had numerous buried utilities, water mains and sanitary sewers. Therefore, there was limited space to construct any new works within the road allowance. VA contacted several manufacturers of oil/grit separators to determine if it was feasible to install a separator (or even 2-3 units in parallel) to achieve a 70% reduction of total suspended solids for the 32 hectare watershed. It was concluded that the CDS system was the only practical solution for this project due to its relatively compact size and reasonable cost. The CDS system uses multiple hydraulic techniques to allow large flows to be processed in a compact footprint. These principles include gravity, swirl concentration and a patented inertial based screening process. 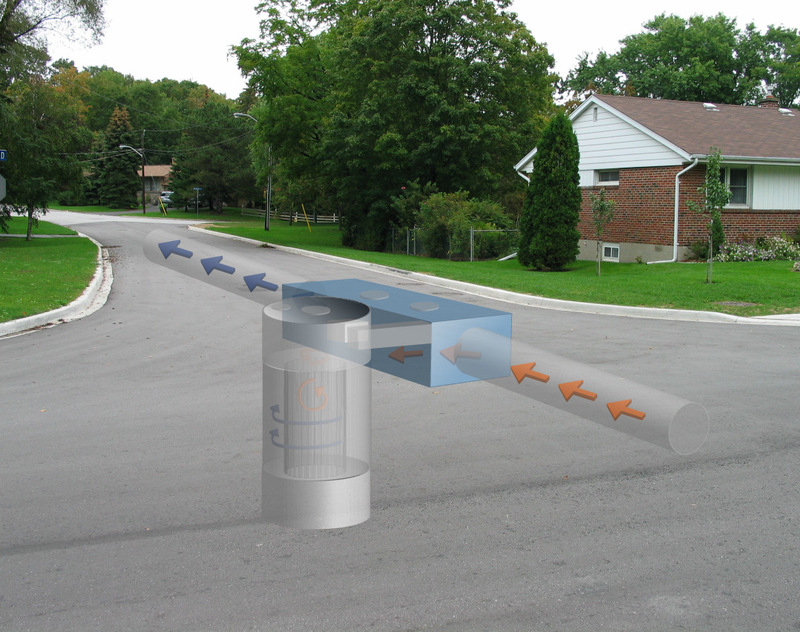 This unique screening system is non-blocking and allows the Town of Newmarket to treat over 700 litres per second from a 32 ha area while removing grit and floating debris. The selected system was a precast CDS PSWC56_78 that processes the storm flow as an off-line unit. A diversion weir box allows peak events to by-pass the treatment chamber allowing the physical size of the unit to be minimized. Contech engineers worked closely with the consultant and local representative (ENV Treatment Systems) during the design phase to provide structural and hydraulic calculations for the system. The CDS system allowed the Town of Newmarket to do what has not been possible in the past – positively remove buoyant material and grit from stormwater with a non-blocking non-mechanical screen. By employing a unique combination of hydraulic principles the CDS system is able to engage the energy in the storm flow to effect grit separation. CDS sharply contrasts basic gravity separators where high storm flow energy can deteriorate grit removal performance. Whereas basic gravity separators need huge tank volumes to dissipate energy, CDS systems can be designed in a very compact manner. The optimized footprint of the CDS systems not only minimizes capital and installation costs but provides a significant benefit to long term maintenance costs. To properly clean out an oil-grit separator by suction truck method the water must be removed to access the grit. By reducing the water holding volume by a factor up to five over conventional gravity separators, CDS systems can reduce annual maintenance costs by thousands of dollars. CDS Stormwater Treatment Systems offer municipalities a new approach to treating their trunk line sewer systems in fully developed areas where land availability is at a premium.